This post is dedicated to the memory of sarod maestro Pandit Buddhadev Dasgupta who passed away recently. Rendered by countless semi classical and Bollywood singers, this is exactly the kind of composition which brings out the character of Pilu. The structure of Pilu alternates between phrases which stress hope and joy and phrases where the same hopes are dashed and recede into sadness. This mesmerising mix of emotions makes Pilu an eternal source of joy and sadness – the definition of human emotion. Skilled musicians in Pilu often draw this out, inventing a myriad ways of portraying this struggle. I was once told by an audience member that Pilu feels like a conversation where someone is telling the story of their love. Laawaris (1981) sung by and filmed on popular actor Amitabh Bachchan. “Saare Jahan Se Accha Hindostan Hamara” – [Our country – Hindustan – is the best in the world] -a very popular patriotic song composed in Urdu by Poet Mohammed Iqbal and set to Pilu by Pandit Ravishankar, which is a fixture at National events in India and also used as a march by the Indian Army. The world Mishra (which means -Mixed) is used to denote variants to the raga which are acceptable but not formalised. In many ways, affixing Mishra to a raga means that the raga will be extended in directions which are not part of the core raga. It must be kept in mind that Mishra usually is used for light ragas (e.g. you cannot have Mishra Marwa or Mishra Darbari). Mishra Pilu allows musicians to add tasteful, subtle and aesthetically pleasing phrases to core Pilu. In doing so, they may use notes that Pilu doesn’t usually use. In the performance above, I have played a composition which uses the Tivra Ma which is not used in Pilu. These notes have to be sparingly used to embellish tastefully. Calling a raga Mishra is not an open invitation to wreck the core emotion of the raga by adding whatever you feel like ! In this Mishra Pilu, I end up using all 12 notes in various compositions. The second one again is vintage Ustad Amjad Ali Khan – a terrific composition using the komal dha which is no longer heard commonly. Barwa, is a raga similar to Pilu. There are two schools of Barwa : one which uses the shuddha gandhar (ga) and one which doesn’t. I’ve opted for the former. Some Shahajahanpur compositions – I did not play a popular composition from Shahjahanpur players composed by Pt Buddhadev Dasgupta who interpreted a song composed by Tagore in Pilu called “Shedin dujone” as I wanted to focus on compositions not usually heard in the public domain…. It is a challenge for tabla players to hang on to the beat as the instrumentalist goes off in a completely different cycle. And finally a fast composition by Ustad Shahid Parvez. As always, my gratitude to gurus: Ustad Amjad Ali Khan, Pt Sugato Nag and Ustad Shahid Parvez. We had no time to meet and practice, so resorted to sending each other sound clippings recorded on the phone ! The composition below is originally from sarod maestro Pandit Buddhadeb Dasgupta as communicated by his senior disciple sitar virtuoso Pt Sugato Nag…. I’ve played the full composition including the antara, which is usually missing in other recordings of this piece. 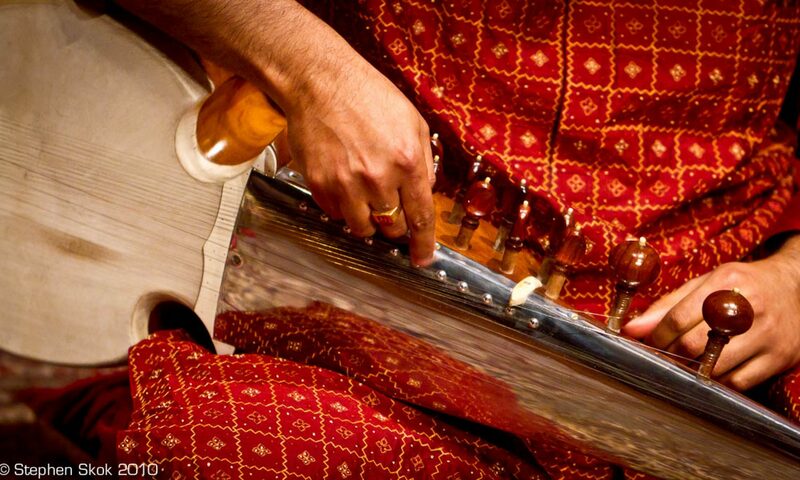 Gorakh Kalyan (a raga with a curious name since it has no obvious relationship with the Kalyan group of ragas such as Yaman Kalyan, Shyam Kalyan, Shuddha Kalyan or Puriya Kalyan) is a raga of peace… and is especially suited for the sarod. Due to the acoustics of the venue, the sound is raw. At a recent concert by a visiting vocalist (Shri Kuljit Singh Sangar), he sang a fast 16 beat composition in Bageshri. I heard it and then went about my own business, but the composition stayed with me mentally. A few days later, I was able to take the gist of the composition and translate it to the sarod. I initially thought I’d come up with a new composition based on the above khayal, but later on it turned out that I had actually made a similar composition with a similar structure. Next step: to compose a matching antara…..
First post for 2016… have been away for some time .. The setting was in a private residence in a beautiful part of Melbourne called Eltham… and it had a resident peacock which kept calling out at times..